Pearls are considered organic gemstones, and are formed in shellfish, namely mussels, oysters and sea snails, as a natural defense against irritants such as granules of sand or grits. When these irritants gets inside the shell, the shellfish secretes layers upon layers of aragonite (CaCO3 calcium carbonate), that together with conchiolin and a small 2% of water, will gradually build up to form the solid pearl. The pearl gemstone, also known as Mukta or Moti, according to Vedic astrology, is the primary gem for the Moon or Chandra. The ascendants that benefits the most for wearing a pearl gemstone are Cancer, Scorpio, Aries and Pisces. It can be worn as a ring or pendant. The pearl should be worn first on a Monday, an hour after sunset, when the moon is waxing. It should be set in a white metal. If set in a ring, it should be worn on the pinkie finger of the right hand for males, left hand for females. 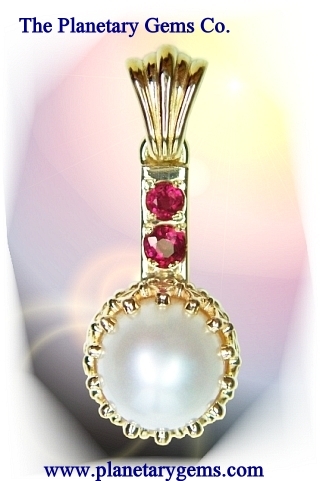 Due to the pearl's softness, best is to have it set in a pendant. "Aum som somaya namah" repeated 11 times at the time of wearing a Moon talisman. "Born from the wind, from the air, from the lightning, from the light,...born from the gold, may the pearl protect us from any fear"
Color: The color of a pearl is the result of a body color and an overtone color (known as orient) present (due to surface effects) as a lustrous sheen. White, light cream, light rose, light yellow, blue and green overtones on a white body, black and colored pearls. Density: 2.6-2.78; conch pearl, 2.85; cultured pearls, 2.72-2.78, i.e., heavier than most natural pearls, but this is not a diagnostic fact. Occurrence: Saltwater, natural pearls are the most important on the market place. These come principally from the Persian gulf (coasts of Iran, Oman, Saudi Arabia and Bahrain State), Gulf of Manaar, Indonesia, Myanmar, Philippines,Australia, Japan, Venezuela, Mexico. Freshwater pearls come from alkes and rivers throughout the world. Emotions under control. Good memory. Balanced emotional life. Success, happiness and comfortable life can be rather difficult to achieve. Sicknesses during childhood. Fluctuations, moodiness, instability. Indecisions, lack of mental balance. Desire to lie and spread false rumors. Suffering from anxiety.